1 What is a keyframe? 2 What does a keyframe looks like? A keyframe is a basically a "mark" in the timeline. This mark allows the user to make Synfig remember the state of the animation at that point (frame). It means that the keyframe is like a label that tell Synfig that this frame should be taken into account when creating waypoints. It also indicates that the marked frame is a special frame where the information of every parameter of every layer is stored in order to be reused later. Each keyframe is associated with a particular frame and a frame can only have one keyframe. What does a keyframe looks like? 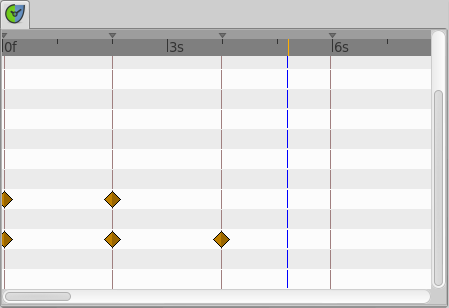 A keyframe looks like a light brown vertical dashed line in the Time Track Panel placed at the corresponding frame. You can distinguish it from the Time Cursor by its color (the time cursor is blue). The symbols shown in the image are waypoints. The keyframe representation in the Timebar change according their states : "Normal", "Selected" or "Deactivated"
A keyframe doesn't necessarily imply a waypoint, and a waypoint doesn't necessarily imply a keyframe. A keyframe could live all the time without any waypoint but it stores the information of the values of the parameters on that specific frame. If there is a waypoint there then the waypoint information (only the parameter value) is stored too. If there is no waypoint in the keyframe then its "stored" value is the result of the surrounding waypoints, its parameter values and the interpolation values the waypoints have. This means that a keyframe remembers the values of the parameters at that frame but does not keep them static at that frame. To maintain a parameter's value static in a certain frame you must use a waypoint. The creation of a waypoint can cause the creation of new waypoints on the neighboring keyframes depending on the current value of the Editing Lock Keyframes state. So, maybe, the creation of a waypoint (modifying a parameter or pasting or moving a waypoint or even duplicating a keyframe) can lead to the creation of a waypoint in the keyframes that are immediately before and after the inserted waypoint's frame. 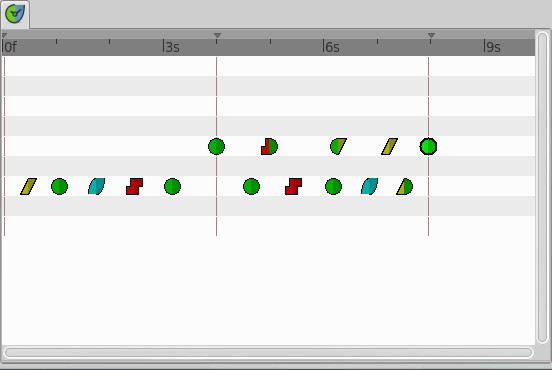 The waypoints created in the neighboring keyframes are created according to the default interpolation value in the toolbox window. See the examples to understand how this works. 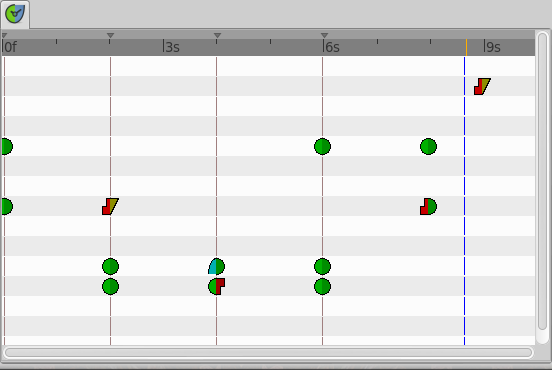 You can see in the Keyframe list dialog that there are four headers and before that, an empty column. This empty column maintain checkboxs related to keyframe activation : enabled or disabled. By changing the state of the checkbox you can activate or disable the keyframe. 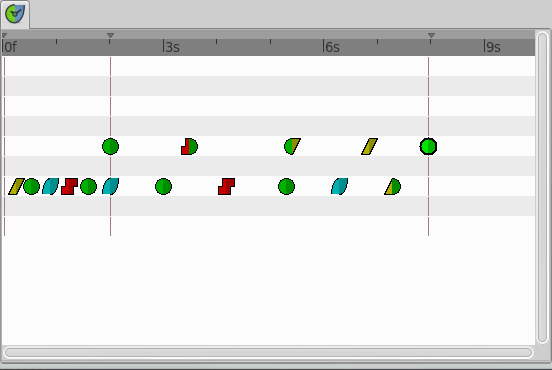 A visual information about the keyframe state is displayed in the Timebar. You can modify the time (frame) where the keyframe is placed just making a click in the corresponding "Time" cell. It will allow modify the time forward or backward the amount that you want. You can also manually place a keyframe at the desired time using the Timebar. The existing Waypoints in the keyframe will move to the new position. If any parameter have a a waypoint in the time line, then the moved keyframe will have a new waypoint set to default interpolation on those paramter(s). According to the default interpolation method and the Editing Lock Keyframes status and to the parameters that have any waypoint in the time line, new waypoints will be created on the neighbouring keyframes of the destiny time (frame). The original neighbouring keyframes will be untouched if don't coincide with the destiny neighbouring keyframes. See the example to see how changing the time of a keyframe works. 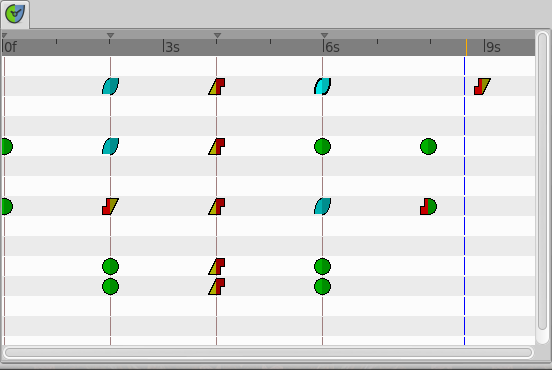 Length parameter sets the time the keyframe is exposed in the timeline until next keyframe. You can also manually change the length parameter using the Timebar and holding Alt key on releasing the mouse button. Changing the parameter shifts all following keyframes and Waypoints forward or backwards. 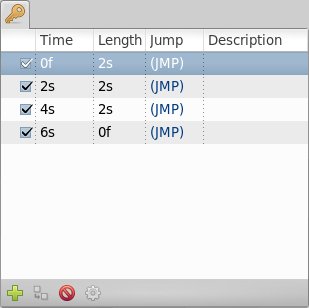 The Jump column is only a short cut to place the Time Cursor at the keyframe where you make a click in the "(JMP)" label. This cell allow the user insert a short description of the meaning of the keyframe. Just make click on it and change the text. Hitting the keyframe Properties button, the "Keyframe Properties" dialog will appear. This dialog allows change the interpolation method for all the waypoints on the keyframe at the same time. Even if, for a certain parameter, there is no waypoint on the keyframe but the parameter have other waypoints in the time line, then when you apply the "Keyframe Properties" you will add a waypoint at that keyframe were there aren't currently any waypoint. The added waypoints have the interpolation methods stated by the dialog. It means that the "Keyframe Properties" dialog will modify the interpolation methods for all the parameters that have any waypoint in the time line. In: Checking this value you can change the interpolation method of the left part of the waypoints of the current selected keyframe of all the layers of the canvas to the selected interpolation method in the drop down menu. Out: Same but for the right part of the waypoint. This dialog would not affect what's the interpolation method for a new waypoint created by the user, automatically created by the keyframe duplication or by the lock keyframe state. The interpolation methods for new waypoints created in those cases will be both the same ("In" and "Out" or Left and Right) and depend only on the Default interpolation method of the Toolbox window. See the examples to understand better how it works. is linear due that they are the only two waypoints of the animation for that parameter. At 0s none has changed. Not affected by the insertion of the keyframe. It is two keyframes away from 6s and also have a waypoint. At 2s there was a keyframe and stills there. But previous to the creation of the keyframe at 6s the current interpolated value of the "radius" was 25.0. After the creation of the keyframe at 6s the radius is the result of the interpolation between 0s and 4s frames waypoints with its radius values and its interpolation methods. That is 25.78125. This keyframe is more than one keyframe away from the new 6s keyframe so no waypoint is created. At 4s there was a keyframe and still being there. But in this case the 4s keyframe is a neighbor of the new 6s keyframe. As well as the lock keyframe state was set to "All keyframes locked" then the keyframe at 4s has been locked adding a waypoint on it. The radius value hasn't changed (still being 30.0) because it was locked adding a waypoint with its current value). The Interpolation mode of the waypoint was set to "TCB Smooth" as stated by its default value. At 6s there is a new keyframe with a new waypoint with the old value of the interpolated value of the keyframe at 2s. That is a "radius" of 25.0. At 8s nothing has changed. There wasn't any keyframe and there was a waypoint so nothing is expected to change. 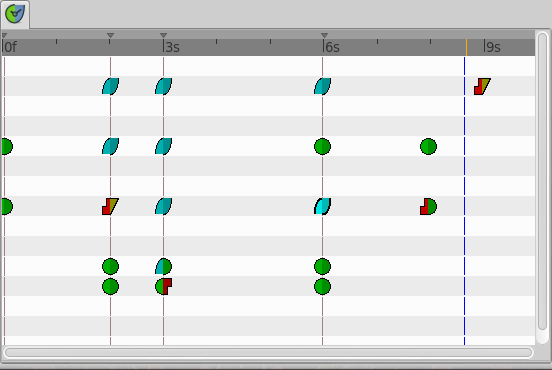 Now you can see that the keyframe at 2s doesn't hold the value of the parameter by itself. It only remember the value if a waypoint is created on it, by the result of the insertion of a neighbour waypoint, or if a keyframe is duplicated and the lock keyframe status affects that keyframe. In this example the value at 2s has changed drastically due to the different interpolation method for the created waypoint on 4s. If in this situation you duplicate again the keyframe at 2s to other frame (ej. 10s) then it would copy a keyframe with a waypoint on it with a radius's value of 20.0, what is the current value of the parameter in that keyframe before duplicate it. In the sample the animation duration is 10 seconds so the image shows all the existing waypoints and keyframes. The time cursor isn't over any keyframe. Default Interpolation method set to "Ease in/out"
Lock Keyframes status set to "All Keyframes Locked"
The existing waypoints at 4s keyframe have changed its interpolation methods according to the "Keyframe Properties" dialog. There are new added waypoints at 4s keyframe. The waypoints are added to the paramters that have almost one waypoint in the time line (for example the one that have only a waypoint at 9s). The added waypoints at 4s keyframe have the interpolation settings that was stated by the "Keyframe Properties" dialog. New waypoints have been created for the neighbouring keyframes to 4s (2s and 6s) for all the parameters that have any waypoint in the time line. The waypoints are created in the neighbouring keyframes according to the Lock Keyframes status. Also the created waypoints interpolation method responds to the default interpolation method you have set. The existing waypoints at 4s would only change its interpolation method on the side the check box was checked on. The other side will be untouched. The new added waypoints will have the interpolation method set to "TCB Smooth" method where the check box is off and the interpolation method set by the "keyframe properties" dialog where the check box is on. In this sample it was only checked on the "In" check box. You can see how the waypoints at right and left of the moved keyframe have been compressed and expanded in the time line. Also notice that any waypoint has been formed in the moved keyframe at the paramter at the bottom of the list but yes in the static keyframes. It seems to be a bug (?) - to be verified. If you want to learn more about advanced uses of keyframes see this tutorial about reusing animations. Keyframes can be like stored "poses" that can be reused several time in the animation. Very useful for lip sync. To properly use the onion skin feature (AltO or "<Menu Caret> → <View> → Toggle Onion Skin") you should consider the frame where the keyframes are set. Onion skin will show you the before and after keyframes images with a 50% opaque copy of the current view. Also the current view is 50% opaque. See Onion Skin for more detail. Using a Synfig plug-in it is possible to quickly import keyframes from a list of timings, as explained in the Audio Synchronisation tutorial. This page was last modified on 4 October 2015, at 10:59.